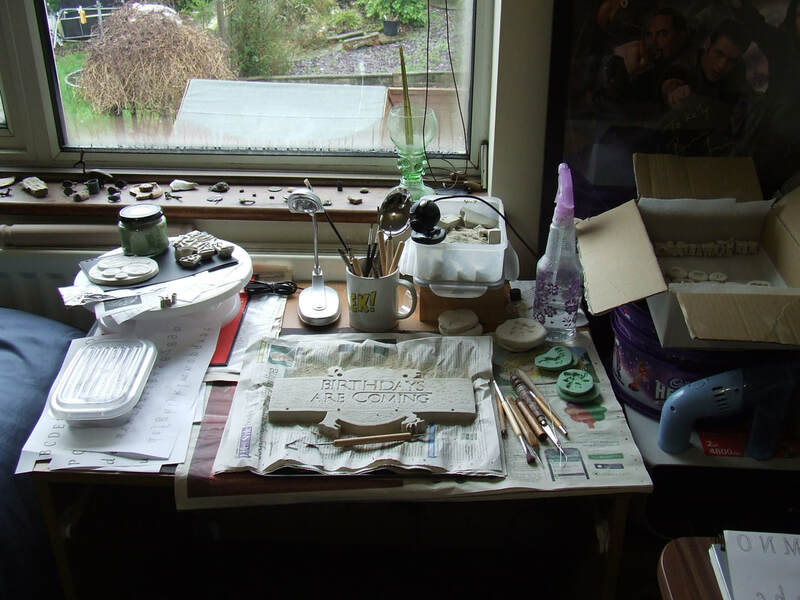 Growing up, I never had to work in a space smaller than a garage when it came to clay. My mother either bought houses with large areas that could be converted into studios, or designed and built her own house to suit. I’ve since realised – painfully – that I was very spoiled for space. In comparison I now have a small table at the end of my bed, and an outdoor shed for firing that we had to break three laws of physics to get the kiln through the door. It’s... difficult. In light of these ‘character building’ challenges, I’ve had to adjust my practices to be able to produce the same size and quality pieces. It’s been tough, it’s often frustrating, but it has been a good exercise to prove that you really don’t need much space to be able to do this sort of claywork. I think it’s possible – likely, even – that there are other people in similar situations to me. Hopefully there will be a few tips and tricks in this article to help you set up your own mini-studio in whatever area you have available. First and foremost, you need to be able to set aside a space that can be dedicated to the clay. You really don’t want to have to be packing everything up after every session and then getting it out again the next time. The kitchen bench is not going to work. Things are going to get messy and moving them around isn’t practical if it means you’re going to drop flakes of dried clay everywhere. So find a fixed table out of the way somewhere. I’d personally suggest away from electrical items, but then I must admit that I’ve blatantly ignored this advice myself and have my clay table right beside my computer desk. The only reason for that is that the clay dust may interfere with the electronics down the track, but so far so good for mine. Clay dust is a problem. If you’re working in the same way as me and doing a lot of detailed work when the clay is bone dry, you’re going to be generating about thirty cubic metres of dust a year (possibly an exaggeration, but it feels like it). Gone are the days where I could merrily blow it off my work and have it form archaeologically interesting sedimentary strata in the corners of a studio where it didn’t matter. Now, if I try that trick I’m going to need a shovel to go to bed. I find it handy to cover my work surface with something removable that I can take off and either clean or replace every now and again. I began by using paper but have since upgraded to waterproof canvas. 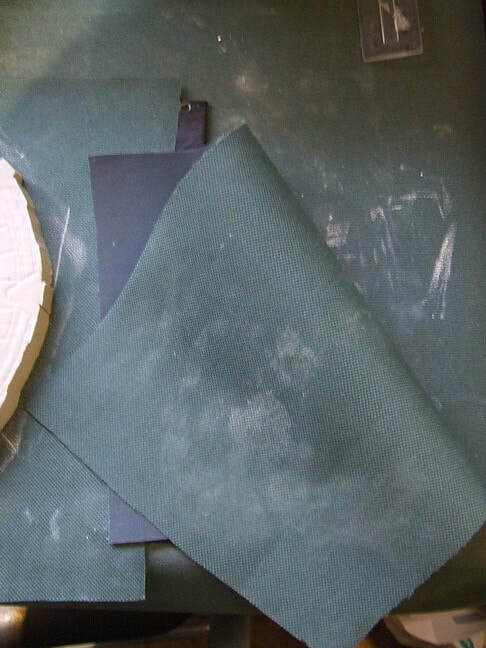 I’d recommend the tightly woven cloth above the paper as it is more likely to hold the clay dust in position and less likely to be damaged by spilled water or general wear and tear. A small soft-bristle brush and little bowl for collection is best to gently shift the clay dust from where you’re carving, and in addition, a small hand-held vacuum is great for picking up the little hillocks that collect in those hard to reach areas. The dust collected in the bowl can easily have water added to it to make instant slip, or be reclaimed for later use. 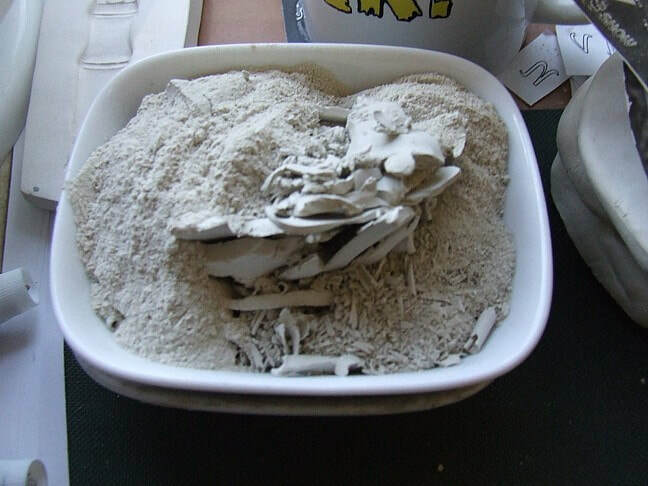 If you’re working to a reasonably large scale, clay generally comes delivered in 12.5kg bags that sometimes have dried clay crusted around the opening, even before you start taking clay out of it. I find it fairly unmanageable in this form, so at the start of a new bag I’ll take it into the bathroom where I can safely make a mess to cut the plastic away and then dismember the clay into 2-3kg sections. These are stored separately in airtight containers that can be stacked in a corner somewhere (away from direct sunlight as this will cause the clay to sweat, grow algae and dry out). I would strongly recommend not filling the containers up fully, but leaving a gap of about an inch around at least one (preferably two) edges so you can get your fingers underneath to bring it out when you need to start using it. 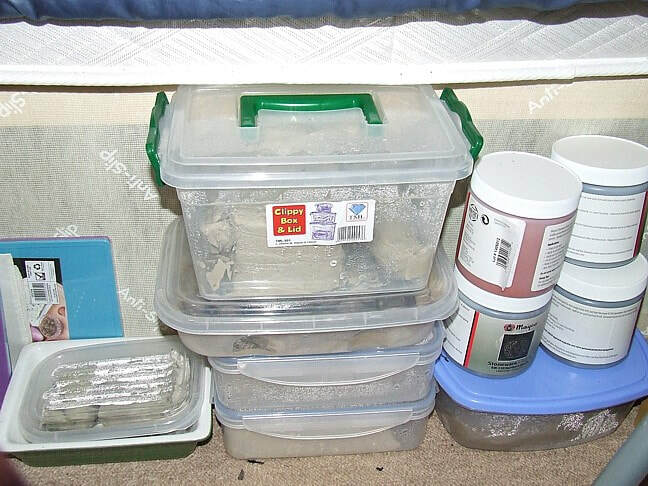 Providing you use good quality airtight containers, storing it in this way should help prolong the life of the clay, as they do eventually go hard in the bags. Also, I would recommend opening up the containers once every couple of weeks to spray one or two squirts of water over the top, just to keep them at a nice pliable consistency. 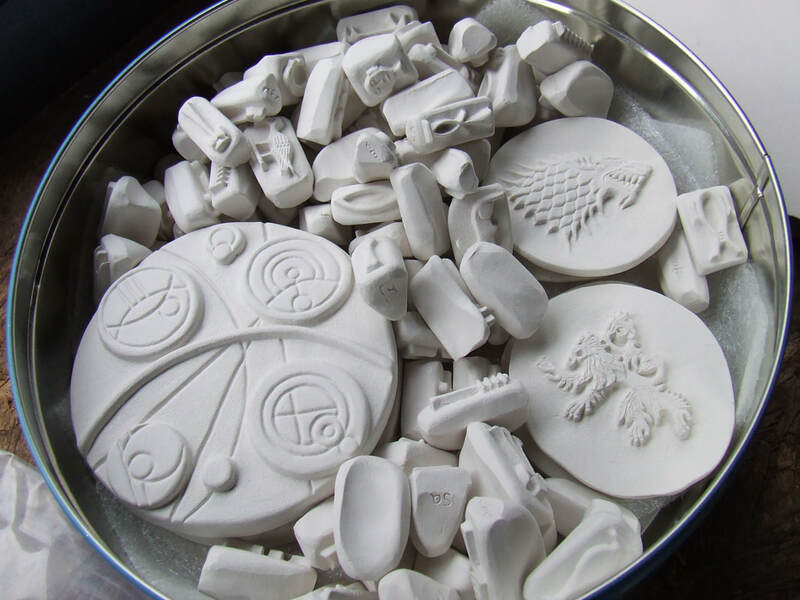 Depending on how much you intend on producing, your raw (unfired) pieces are likely to require the largest amount of space, so keep this in mind when starting out. It’s all well and good to have a workspace but if there’s nowhere to store your finished creations then things can get tricky pretty fast. 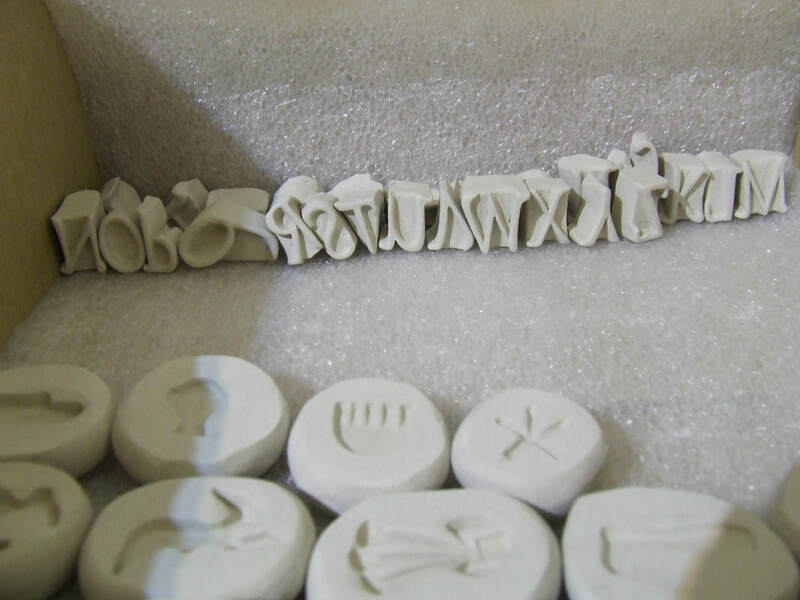 Raw pieces are incredibly fragile so you’ll want to put them somewhere that’s not in the general thoroughfare and also you won’t be able to stack them much on top of each other. Cheap shelving units can be set up, which I’d recommend (shoe racks in particular are a good size), and also placing the pieces on a board to more easily move them around. The boards don’t have to be anything fancy, I use chopping boards, placemats and baking trays. I also store smaller pieces in old chocolate/biscuit tins that have been lined with bubble wrap. You can stack these two or three high if you use a good amount of bubble wrap in between, but only if they’re small and light (and please use common sense here). I personally don’t stack anything above 5cm in diameter, but that’s just a rough guide that works for the relative weight and detail of my pieces. In addition to finding space for your raw pieces, you’ll need to ensure they’re in suitable conditions so they’re not damaged. Direct sunlight is fine once they’re fully dried out, as is heat from a radiator, but keep them away from both in the initial stages of drying. Humidity’s potentially a problem if it’s excessively high, particularly if they’re taken directly from a humid area and bisque fired, as the retained moisture may cause breakages. Insects are another thing to keep in mind, particularly clay wasps, which will attack the raw pieces and either take clay from them or build nests atop them. These nests, being of clay themselves, can damage your piece irreparably. If you have the space, a fridge that’s no longer working is ideal. You can slot in plenty of shelves and the seal will keep out both humidity and pesky insects. Once the pieces are bisqued they can be stacked much more efficiently atop each other, within reason, and packed away in boxes with some bubble wrap. Finally, the last area you need to consider is where you will glaze the bisqued pieces. Your requirements will vary depending on what type of glaze or finish you’re planning on using, but generally speaking glazing is going to be very messy work. Aside from the vexation of accidentally staining your carpet fifteen different colours, there are significant safety concerns to consider. Certain minerals used relatively commonly in glazes are toxic, either through inhalation or contact or both. They can be handled safely, of course, or else there wouldn’t be any potters out there, but they’re not compounds you want running around your living areas. I’ll go into more detail into the relative dangers of various glazes in another article, but in terms of space you will need somewhere outside your home to glaze, whether it’s a garage, a shed or corner of a garden (if it’s the latter, avoid growing veggies anywhere nearby). So while you may think you don’t have enough room to start your ceramic hobby or business up, take it from me that it can take a lot less space than you think. A desk, some shelving and somewhere outside to glaze and fire will be enough to set you on your way.